Welcome to my Woodsy Tea. I love the fall air and the falling leaves. The plaid blanket is a perfect table cover for serving tea. The Tea cup and saucer have a Pheasant and a Mallard Duck on the front and back side. The grape vine wreath and red accents add to the glory of Fall. The wooden napkin rings give the tablescape a woodsy feeling. We're outside again under the pergola enjoying the last days of fall. The weather will soon be cooler and I'll be putting the garden to bed for the winter. But we can sit awhile and enjoy the last days of Fall. With the birds circling the saucers, the wooden handled knife and red handled teaspoon make a great match for an outdoorsy look. This oil lamp came from my mother's estate. I love it so much. Beautiful are your Woodsy Tea photos! oh this is just gorgeous! LOVE that wonderful plaid blanket!! Love your woodsy tea. 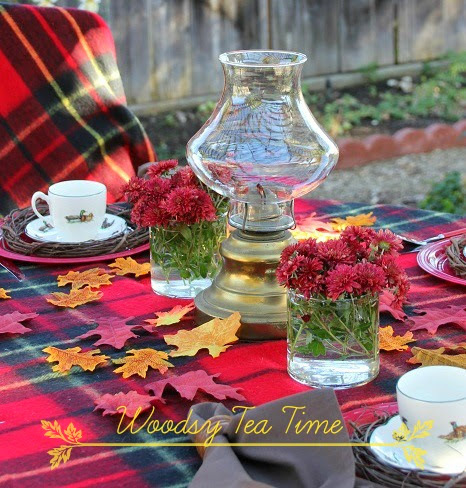 Perfect plaid blanket in fall colors to use as a tablecloth and darling cups and saucers. Drew me right in and I can taste that warm tea on a pretty fall day. Such a pretty table, so warm and welcoming. Love those tea cups. What a great find! This is a cozy looking tea time. Love your tartan blanket! I recently picked up an antique oil lamp at an estate sale and gave it to my sister for her collection. Yours adds the perfect woodsy touch to your table. What a lovely table setting for this time of year. Warm & inviting! Love how you used the blanket for a tablecloth. A very cozy tea setting! Each accessory has its duty and enjoyed reading about its origins! A special mood has been created; lovely. Your woodsy tea is so cozy, Betty. I like the tablecloth and leaves strewn about. That teacup is really cute with the wild life on it. Wonderful find! The oil lamp makes a delightful centerpiece for your table. My Daddy used to collect oil lamps and now whenever I see one I think of him. Thank you for sharing and joining me for Tea Time. Have a delightful week. I enjoyed your woodsy tea so much! Your table so pretty in the fall colors. Great find on the teacups! I love the crimson color of the tartan plaid. Looks so pretty for fall season. The leaves on the table match exactly as the plates do. This is really a wonderful table and I enjoyed my visit very much. Thank you for sharing and have a nice day. This is such a lovely and cozy table BEtty with your wonderful throw on it and also your dishes! Perfect for fall. Your images are gorgeous, Betty. A beautiful setting for an autumn tea! Stunning woodsy tea! You really brought out the warmth with your gorgeous red table covering. The tea cup is perfection with it all! It is really chilly here today for the first time this fall. More tea please! Love these colors. So rich. Thank you for bringing this to Seasonal Sundays. Love your woodsy tea. The wood napkins rings and wreath ring under the cup is a great idea! How lovely! Thank you so much for sharing at the Twirl & Take a Bow Party! Have a great day! How very lovely. I should do something like that before it gets too cold. Betty, nothing like sitting outdoors and enjoying tea under a pergola. We have one and love it! We have put our garden to rest for the Winter and no more dining outside for us. Wouldn't you know it, it was in the 60's today. Warmer than usual this time of year. I love your use of the plaid blanket and the cups and saucers are perfect! Thanks for sharing with SYC. Hi Betty, just hopping back to let you know that I will be featuring you at SYC later today.